The WR250 integrated with the S-Pack module (below). Wirtgen says its brand-new class of compact milling machines combine the advantages of its small milling machines – manoeuvrability, one-man operation and flexibility – with the front-loader principle and productivity of its large milling machines. The most powerful machine in this class is the W 150 CFi, which celebrated its world premiere earlier this year at bauma, the world’s leading trade fair for construction, building material and mining machines and construction vehicles and equipment. For maximum traction of the crawler tracks, Wirtgen has adopted the central cutting drum design from its large milling machines. To efficiently transfer the tremendous power of the W 150 CFi to the road, this model also has an ISC traction control system, which ensures that on demanding milling jobs all four crawler tracks run at constant speed and high traction to achieve maximum milling performance. With an operating weight of 20.8 tonnes, the W 150 CFi can be transported without a special heavy transport permit in most cases, and that is another major advantage for completing milling jobs flexibly and quickly, the spokesman adds. 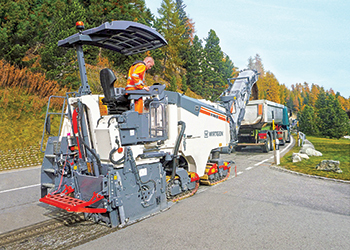 Wirtgen offers no less than eight models to customers in the compact class, with standard working widths between 1.0 and 1.5 m and depths up to 330 mm. Combined with the flexible cutter system, working widths from 8 cm to 1.5 m even are possible. “The entire line of machines – including the W 100 CF/W 100 CFi, W 120 CF/W 120 CFi, W 130 CF/W 130 CFi and W 150 CF/W 150 CFi – offers high output and cost-efficiency,” says the spokesman. “Application range from classical small milling machine operations, such as partial road repairs, all the way to the removal of entire roadways, a job usually reserved for the large milling machines. In other words, Wirtgen’s compact milling machines are extremely flexible. Like the new generation of small milling machines, Wirtgen has also equipped its compact class with numerous added and automated functions, integrated in both the uniform operating concept and various control functions. This results in simple machine operation, fast and precise milling and levelling processes. 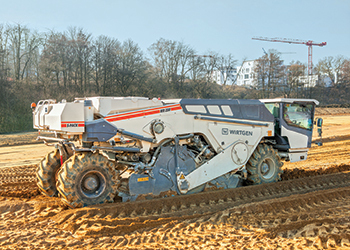 The modern control technology in Wirtgen’s compact milling machines also displays its advantages in terms of steering. In the 1-m milling machine W 100 CFi, for instance, the right rear support wheel can be folded in automatically, without lowering the milling drum or manually loosening a bolt. In addition to the “basic position”, the right rear crawler track also has the new positions “outside” and “folded in”. In the “outside” position, the crawler track is located within the cutting diameter of the drum, enabling the machine to be easily positioned along the right-hand milled cut. Wirtgen has practical solutions for transferring the milled material to save time and money. The conveyor’s extremely wide slewing angle of 60 degrees in each direction makes it possible to transfer material even on difficult job sites, such as traffic circles or intersections. For high-precision material transfer, the machine operator can move the conveyor at two different speeds. And thanks to the most advanced control technology, the conveyor speed is held constant even if engine speed fluctuates. The W 100 CFi ... a compact milling machine. 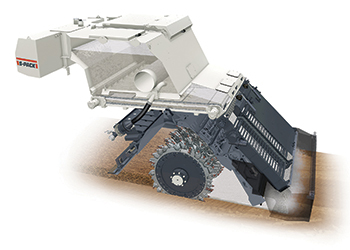 Meanwhile, with the addition of its new S-Pack (spreader pack) module, Wirtgen offers new opportunities to optimise the range of applications and cost-efficiency of its portfolio of recycling and soil stabilisation machines and systems. The spreader module can be integrated with the company’s WR 240/WR 240i/WR 250 models. It allows the binding agent to be spread without generating clouds of dust and can be used on motorways, in residential areas, on industrial estates and on difficult terrain – where recyclers and soil stabilisers are confronted with an extremely varied range of situations. “In many cases, contractors face additional challenges due to strict emission standards, for instance in nature conservation areas. A solution is now available for these applications too in the form of S-Pack,” says the spokesman. He says the company offers an unrivalled range of mobile machines and systems for a whole variety of applications in its recycling and soil stabilisation product division. Using the integrated spreader module, a WR with an S-Pack spreads the binding agent directly in front of the milling and mixing rotor which immediately mixes it into the soil. The closed drum housing and an additional double curtain of rubber matting prevents the formation of dust clouds and ensures that the material is exclusively spread inside the milled cut. Thanks to the integrated spreader module, the binding agent can now be spread regardless of wind and weather and without drifting or displacement due to the vehicles driving ahead or passing by. Materials such as cement or lime must be spread safely and precisely and processed without emissions. “This is particularly true in sensitive areas such as industrial estates that are subject to restrictions on account of food production facilities or areas near airports. This applies especially to motorways, where drifting must be prevented in order to avoid endangering the flow of traffic,” he says. Spreading is optimised by a number of sophisticated technical features. Metering cells ensure that the binding agent is applied in precisely metered volumetric quantities, and equally precise, continuous control of the spreading quantity is assured by microprocessor-controlled processes. A two-part transverse auger is continuously supplied with binding agent by a conveyor unit and ensures that the material is uniformly applied over the complete working width of 2.4 m. In addition, the maximum spreading width can be incrementally adjusted to 1.6 m and 80 cm by individually switching the 80-cm-wide flaps in or out. Depending on the application concerned, the spreader can deliver between 1.5 and 40 kg per sq m.
The level in the binding agent tank (which has a maximum gross capacity of 5.5 cu m) is monitored at various points by extremely sensitive sensors and precisely indicated on the control display at all times. The spreading quantity is simultaneously calibrated via the display when the bulk density of the binding agent is entered. In addition, 10 exhaust air filters with automatic self-cleaning function not only ensure effective purification of the exhaust air through the high air flow rate, but also allow the binding agent tank to be filled completely in less than five minutes, thanks to the readily accessible filler port. Operation of the integrated spreading system and diagnosis of the work process are extremely simple intuitive actions effected via the control display in the driver’s cabin. The machine operator is in control of the mixing process at all times and can adapt the metered quantity to the current situation.